(update) The following pro-vaccination news links illustrate the Adversary's advancing agenda. We are against vaccination, which has been shown to be part of an deceitful campaign, intending to not only rob us of health and life, but change our DNA, in a bioforming action that prepares us to receive the coming beast and his mark. Mom: "Family that refused vaccination put my baby in quarantine." Gray State: director David Crowley - murder/suicide? Really? 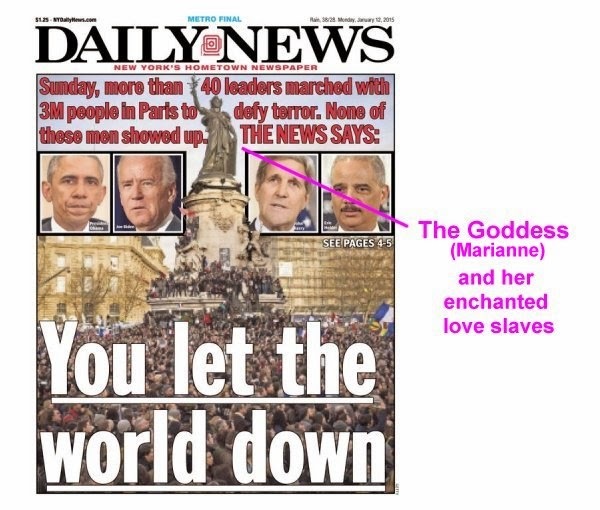 They were joined by a creepy giant "Goddess of Liberty" puppet. The march ended at the Place de la Nation, where a monument to the goddess stands. Marianne, aka Our Lady of the Nations aka Isis aka Mary. Where is the black awakening, the mass triggering? We've been seeing it in stages in various locations. I believe the masses are proving to be so easily controlled that a more dramatic work has thus far been unnecessary. The world is nearly ready to receive their savior, and the time appointed for his arrival is nearly upon us. An old plan seems to be unfolding. The Falcon Rescue. Have you caught on to the grand plot, the most epic conspiracy? The second and last part of a video series decoding Mitsubishi's Outlander Sport commercial has just been published. It's a layered enactment of 2 Thessalonians 2. The events leading up to the revealing of the lawless one, the antichrist beast, are pictured. Featuring stargate language and imagery, heavenly vehicles, Egyptian magick, Masonic tracing boards, phoenix palm, skull and bones, NLP, Theurgic ritual... A related Outlander Sport commercial reveals that the setting for the mirage on the Mirage scene is the Four Queens Hotel and Casino in Las Vegas, which represents an embedding of Queen Isis (4, of the 3.4.5) that represents the coming of the hoax as the Queens Mirage. On many levels, the commercials for Mitsubishi Outlander Sport are evidently working toward the day of the falcon rescue, when dead King Osiris will be raised into Horus through the agency of Isis. Casual looking stealth weapons like these have been forged as in the fires of hell against the saints in a secret war that goes almost entirely unnoticed. Aaron and I had the privilege of decoding many of these, for my benefit and yours. Are you prepared for what's coming in the earth? The Outlander is returning in April. Don't let him make sport of you. Don't fall for it when the Goddess casts her most mighty spell. Very few among us are immunized against the pharmakeia appointed for that day. Do you know when that will be? Some do, and that matters, a lot. The Falcon Rescue - and the Setup! During the recent Christmas season, stargate transits were definitely trending in the cable TV programming. I was led to produce some videos of commercials, and here's another, advertising the Mitsubishi Outlander Sport. It's a casual looking production, but the scope and scale of Occult layering is impressive. So much so, that even in this twilight hour of the age, it's on this presentation that the Lord has me steadfastly focused. Mitsubishi's Falcon Rescue commercial is about the rescue of Horus from his place of exile, releasing him back into our dimensional realm. That's a picture of the revealing of the lawless one, 2 Thessalonians 2. Included in this commercial are the manipulations that prepare the world to receive him, which we already see at work in the news. Don't you think it was a little strange that the staffers at Charlie Hebdo were slaughtered as if it was a St. Winebald Day ritual sacrifice? What's behind that, and all the racial violence that has to be seen as related? We're being managed, toward the goal of uniting us under one king, the false messiah. Just before a fraudulent savior will conveniently appear on the scene, saints who consider themselves too well informed to fall for such a fraud will be hoaxed, and will indeed fall for it. Doubt it? Watch the video and see it dramatized, again. The text goes on to make the point that the day of the Lord, with our gathering to Him, has not yet come, and we're assured that it won't until after we see a sign, actually two signs in tandem. The main sign is the revealing of the lawless one himself, in Mitsubishi's allegory, the Falcon Rescue, and the other is related to it as a prelude and segue. An epic hoax is appointed for our near future that will quickly shake saints from their composure, and they won't recover until they have suffered substantial loss for the failing of their faith. What's going to be targeted is our hope in the promised reward for obedience that comes with resurrection, and a joining with our Bridegroom. The Mitsubishi commercial spills the beans on how we're going to be presented with the illusion that the Messianic Bride and Groom already married and left on their honeymoon. Obviously then, the conclusion is that we missed out. It already happened. We're going to be shown a vision like a mirage, a distorted image that will deceive many. As I have written on The Open Scroll, with extensive and some very technical documentation, we should expect an impressive kind of multimedia - multisensensory - multidimensional vision that will be experienced around the globe. This almost irresistible projection, through time itself, will engage and convince the world that the only hope remaining is in a savior that is about to manifest and show himself to be god. The display will be quite real but yet unreal, an edited version, a fraudulent fabrication that will come with supernatural delusion, and the lies will be accepted by the vast majority as if it is undeniable proof. They shall cry out to Me, but I will not hear them. They shall seek My face, but they shall not find it. Because of their iniquity no place shall be found for them in the day of My coming. My judgment shall consume them, and they will be forced to take their rightful place among the hypocrites. Great and terrible shall be the swiftness and severity of My judgment on all those who have forsaken Me and My ways. Their disobedience shall be a curse upon their heads, and their lawless ways will be the cause of their destruction. Woe to you who have cast your lot with the false shepherds. Their ways are not My ways, and soon they shall be revealed for what they truly are, and all those who have followed them shall realize the folly of their ways. My righteous judgment is near at hand, and I shall not tarry. The days of preparation have passed, and the call to repentance is over. Now you shall receive that which you are due; good for good and bad for bad. Those of you who have chosen Me and My ways shall rejoice in the peace and goodness of the Lord. Those who have forsaken Me for their idols shall know what it means to fall into the hands of the all consuming fire. Thus saith the Lord. The God of Abraham, Isaac, and Jacob has spoken. Love Potion - pharmakeia - sorcery of Mystery Babylon. The actress, wearing a shimmering gold scaled "Nachash garment," ascends through the dome like George Washington's apotheosis, or the Assumption of Mary. She climbs a silken sash, like a third strand of DNA. It's a birth from the womb of Isis. It's the transit of a time-space portal to a golden heavenly city where the future is gold. It's the version of Zion sought by those who seek to enthrone Lucifer's agent. Apotheosis - ascending to godhood, ascension into the heavenly city - through a stargate. Mark of the Beast transformation. Born in the sun Gun God ... invoking the Guardians/Elements - magical ritual. Arched Bridge ~ The Kindom Viaduct - "mecilah"
Beans were spiilled about the upcoming revealing of the lawless one in a Lexus commercial broadcast during the recent Christmas shopping season. I just published a decoding of it in this video presentation. The featured commercial is marketing a Sales Event for the Lexus RX350, but under that pretext, the illumined sponsors are boldly picturing the transit of Horus through the celestial Silver Gate - and there's lots of familiar symbolic imagery to support that interpretation. Perhaps the biggested take away for you is how, in this season of lengthening shadows at the close of the age, an important time code is signaled, redundantly, and in consecutive scenes. The commercial opens with a preview of the stargate transit, bearing witness to 2 Thessalonians 2. In the same setting, we see a modeling of two other passages of scripture. The bow indicates that the Lexus is a Christmas present. It's sealed, as not to be opened until ... the appointed time. December to Remember. The tag line smacks of the line of the poem linked to anarchy and chaos, remember remember, the 5th of November. It's an allusion to Guy Fawkes and another event, the gunpowder, treason and plot. The Jesuit rebellion. Led by the goddess. The Lexus RX is what is known in the industry as a crossover vehicle. It's not a car and it's not a SUV - it spans those classifications. Lexus gives us all a gift by demonstrating what can be meant by the use of this word. By their teleporting of the RX through the stargate they cryptically show us Horus, a crossover vehicle, crossing over though time-space to be welcomed into our civilization. Note that it's a throne vehicle, like the wheeled vehicle of Ezekiel 1. RX Horus is the crossover vehicle from god to man, spanning and bridging. XO mark of the beast, crossover vehicle of the mark that transforms man into beast. Three things and then a 4th is redundantly signaled, and they picture the arrival of the beast. I've been appointed to watch for the signs of the Lord's coming, and the coming of Horus is closely related to the coming of my Lord. There has long been a confusion of identities that involves a masquerading like what is signaled by the pair of raccoons. The imposter is going to be revealed in this season, as demonstrated in this commercial. Lexus is the premium brand of Toyota. They have been showing this related commercial. Stealing the Bride - and that may be you if you let it happen. Should you take the word from the Lord posted by Aaron yesterday seriously? Yes. Yes you should. We do. The bringing of chaos is dominating the news. It's how this old order is being replaced with the new order, which is nearly here. The Goddess Mother Russia, uniting. This pact is to take effect this month. Spain's El Nino lottery spreads $666 million on prize-winners spread out all over the country * AntiChrist! This kind of technology advance is always made to seem like a good thing. But, any potential to do bad is going to be exploited. DARPA probably already has its hands on it. Tell My people all those who have refused to sacrifice their flesh at the foot of the cross shall be found wanting in this hour as My judgment escalates. Woe to you who have failed to heed My call to lay down all that is of this world and pleasing to your eyes, mind, and life. My judgment shall continue to pour forth until the wickedness and sin of My people has been dealt with and their disobedience has been brought back upon their heads. Like Esau you will seek repentance, but you shall find no place for it. With wailing and weeping and gnashing of teeth you will be cast out on the appointed day of My coming that has been foretold. The division of which I have spoken of has come to pass, and soon the days of Great Tribulation shall be upon you. The Target logo is being used as a dimensional portal, a stargate, and the way the design is promoted reveals nothing good. It spills the beans on the current version of an ancient plan, which is to storm the highest Heaven and sieze the assets of the Most High God. It pivots on the introduction of the beast of Revelation 13, an incarnation of the sun god. Their mascot is a pit bull named Bullseye. In a commercial called, Whoosh, Bullseye jumps through the logo as Anubis, the dog headed psychopomp who transits in and out of the underworld duat. If you have caught on to the kind of Occult ritual exposed in the T-Mobile video series we produced recently, you'll find the crossing through circles in the “Whoosh” commercial familiar: mark of the beast! When you see Occult renderings like Masonic tracing boards you almost always see the sun on your left and the moon on your right. Harmerty. The Target brand leverages that same imagery in how their branding sometimes appears. Bob and I have been waiting for the Lord to green light the production of this mp3 for over two years now, and the fact that He has released us to produce this video now speaks loudly to the finality of this current season and to the stark reality of all that lies ahead. This BourneLegacyClipsBioforming is made of the most relevant and hard-hitting segments of The Bourne Legacy that serves as an over-the-top bean spilling operation that reveals the major secrets regarding the true purpose behind the forthcoming global pandemic in regards to viral loading and enhancement of their chosen Super Solider agents. Pay careful attention for references to "tuning," "viral loading," "enhancements," etc. Those of you who have been following this series and the rest of the material on The Open Scroll blog should be able to pick up on these refereces and the other NLP present in the clip. However, if you find yourself unable to do so, or are unaware of what I am speaking about, then you have some serious catching up to do and very, very little time to do so. As a refresher, I have included the overview from the first installment of this 22 part series that describes the point and purpose behind the forthcoming global pandemic, which is important to understand in the midst of so many folks screaming and shouting about 90% of the world being killed off in a pandemic and all other kinds of un-biblical nonsense that is simply not true. “I believe that in the not-too-distant future we will experience a global pandemic event that will serve as a significant escalation of Satan's continued effort to bioform humanity. I believe that the pandemic will be caused by a governnment-funded, man-made bio-weapon superbug that will be engineered to selectively target people with specific DNA profiles in an effort to identify, isolate, and enhance those whose ancestry traces back to the Serpent-Seed bloodlines. For those meeting this specific DNA profile, the superbug will initiate a "viral loading" process that will act as a foundational layering, or enhancement process serving as a precursor to the Mark of the Beast. It is important to note that "Chosen ones", trauma-based mind control victims, Satanic Super Soliders, and/or psi-warriors will also be included in this enhancement process. I have also included some recent links of interest that will be updated on the Series Links: A Bioforming Pandemic page as the Lord leads, Lord willing. Edward Norton's character has a very appropriate quote to end the segment and this post. "It's up and running. Consider yourself informed." Continue to stay alert and watching; the finish line draws near! As I wrote in closing the previous post, the Goddess work is fulfilling a long play of a “Great Work,” working through agents who are even in, and especially in the church. The Pope visited Turkey in November, courting a relationship with that countries orthodox churches. “30 NOVEMBER 2014: Pope Francis appealed for unity between the Catholic and Orthodox churches today as he wrapped up his visit to Turkey with a liturgy alongside the spiritual leader of the world's Orthodox Christians and a meeting with young refugees from Syria and Iraq. The Catholic and Orthodox churches split in 1054 over differences on the primacy of the papacy and there was a time when patriarchs had to kiss popes' feet. At the end of a joint prayer service last night, Francis bowed to Bartholomew and asked for his blessing "for me and the Church of Rome," a remarkable display of papal deference to an Orthodox patriarch that underscored Francis' hope to end the schism. In his remarks today, Francis assured the Orthodox faithful gathered in St George's that unity would not mean sacrificing their rich liturgical patrimony or "signify the submission of one to the other, or assimilation". "I want to assure each one of you gathered here that, to reach the desired goal of full unity, the Catholic Church does not intend to impose any conditions except that of the shared profession of faith," he said. The slippery serpents speak with forked tongues. Assimilation will be required for “salvation” once their savior arrives on the scene. How can we resist? Do you know what time it is, where the goal line is for the Bride? Do you believe what has been revealed about The Sign for the Bride? If not, prepare to be assimilated. It will be for most folks like when those civilizations confronted by the Borg Collective of the Star Trek sci-fi franchise: “Resistance is futile. Prepare to be assimilated.” Not as formally becoming members of the Romish church, but the antichrist universal “Catholic” goddess led faith of Mystery Babylon and the associated kingdom of the beast. The image is telling, with entwining serpents. Oh yeah - plus, there's Ecumenical Patriarch Bartholomew's staff - informing us about what's going on with Him and Pope Francis. The red roses picture the goddess who underwrites the ecumenical bond of false unity. The goddess is working her spell of pharmakeia, and one form manifests through her agents of unity. Before mending the rift with the Lutherans in December, they mended the rift with the Turkish Orthodox in November. The influential Rick Warren had this to say about Catholicism that same month. Here's what he had to say earlier in the year. I was led to analyze the reverse speech on that clip, and what I discovered was very interesting. “it, the authenticity” *reversed*= He innocent? No. Property. “humility” *reversed*= He's doin' me. “if they like what they see” *reversed*= Pease, yet, no - Yeah, I'll lip it. “his loving the children, this” *reversed*= Its in their voice, the near vowel - Satan. “This is what the whole world expects us Christians to do” *reversed*= Would, if it was true. Is this code? Screwed you all. Nascent. Knows isn't. “if you love Pope Francis” *reversed*= S's Nairf Wolf published it. “showed it to a group of priests I was a” *reversed*= Has the wet tear, but bring this news. Pope Francis = S's Nairf Wolf. That's succinct and apt. “Nairf” is a reverse speech vocabulary word I've become very familiar with. It's used as a reference to an authority in the demonic hierarchy. “Wolf” is another familiar term, which really needs no explanation. Pope = Wolf. In Sheep's Clothing. “S's,” is a naming of Satan, indicating that the Pope is Satan's appointed authority. Like with Obama's Yes We Can = Thank You Satan, the word Satan may be abbreviated, sometimes to just a brief hissing sound. I've listened to so many hours of so many people on that strange back channel of communication over the past several years and heard this language used so many times there is no ambiguity whatsoever. There is no misinformation on the back channel. Most folks still can't accept that such a phenomenon is real, so the shills appointed to keep the lid on it have easy work. Apparently the support for the Pope is being required of him by his handlers. Not that it absolves him of responsibility for the support of the goddess agenda and agencies. His brand's imagery reveals His commitment to the goddess and agency of the opening of the Abyss. Saddleback Church. A Woman Riding the Beast. So, the Pope is Satan's Nairf Wolf. We don't really need reverse speech analysis to tell us that. He's the primary agent of the goddess. “The ecumenical meeting was a part of Pope Francis' on-going efforts to bring unity among Christians, previously stating in public remarks, "Divisions among us, but also divisions among the communities: evangelical Christians, orthodox Christians, Catholic Christians, but why divided? We must try to bring about unity. This interview was given immediately following his visit. About his tour of the Vatican, he said, “the places that they took us through, and just uh, you feel that deep respect and reverence for God” (@ 1:20-1:28) At 1:08: “The message 'is is'” = Code Isis! The promotional imagery for the stadium event included the most widely recognized statue of Isis in the world, Lady Liberty. Queen of the Silver Gate. Our Lady of the Olympics. “Stadium”: where the gods of old were honored. Are honored. I am convinced that the one who holds the office of Pope will be the Bible's false prophet, the false shepherd who herds the flock of the world into one pen. The 2012 edition of the Annuario Pontificio, the Vatican's authorized Pontifical yearbook, gives "Vicar of Jesus Christ" as the second official title of the Pope. The first is, “Bishop of Rome.” To be a vicar is to act on behalf of someone, like an authorized agent. In other Bible versions of Revelation 13:12, we find the following relationship defined, which might well be translated as, vicar. The ecumenical working has been active for a long time, with such institutions as the World Council of Churches backing the operation. That was founded in 1948, a transitional year, prophetically, and they fly the flag of “X union O” that supernaturally establishes the throne of the goddess and propels the work. They continue driving toward the goal of that unity, not, as it should be, in the Spirit in the bond of peace (Eph. 4:3), but in the binding spirit of antichrist and a false peace. In 1949, the year after the WCC began operations, Billy Graham rose to celebrity status. He was ordained as a Southern Baptist minister, which is the largest Protestant denomination. This influential “evangelist” is known for large crusades that have brought people flocking from all backgrounds together as one. They are expertly brought to a point of conviction as they receive a watered down skim milk version of the gospel, with a very loose and limited interpretation of what salvation is. Afterward, converts are actively put into the hands of the local community of faith which includes Catholic and Jewish institutions. A web search for, what Billy Graham says about the Pope, will be informative. Billy is now 96 and is pretty inactive, but his legacy work continues, Mystery Babylon's antichrist work of the goddess. The holy and profane must be separated as the grain from the chaff, but Mystery Babylon is a perverse composite. Her appointed end will come, but not until her work of the mixture is complete. The Lord has called out a people to be separate and holy. True unity in the spirit, according to Ephesians 4, is already attained by those who abide in my Lord, who are humble and obedient, who are loved by Him AND love Him in return. No agreement or alliance forged among carnal men in any form of religious structure will serve any spirit but antichrist. In conclusion, it shouldn't be hard to see where all this is going. What is hard, impossible, really, for most to see, is just how quickly this advanced work is going to reach the goal. She's setting us up for a hoax, the biggest hoax ever. Are you ready? In this hour, as we watch according to our Lord's command, there's much to be seen. This is fit for the season because the time remaining for this activity is running out. One of the major trends has to do with the bringing together of the world's population as one. This is the work of the goddess of many names, which may be described as the secret power of lawlessness. It's all about the spirit of antichrist. These signs indicate the nearness of the revealing of the man of sin, of lawlessness. The relations between the US and Cuba were recently improved, due to the efforts of Pope Francis. (The Goddess at Work) He is openly dedicated to Our Lady of Fatima, and it is in “her” service and enabling power that this was done. (Ultimately, as ordained by the Sovereign God, for accomplishing His own purposes, it must be said.) While there is increasing conflict, even sometimes in the very name of ISIS, this conflict that is inspired and led by the goddess of rebellion is intended for the purpose of resolving it with unity in a differently structured form. Revelation 17, esp. 12-13. On the religious front, the ecumenical movement is making unprecedented advances, with the Pope at the fore of this devoted work of the goddess. So, the most widely recognized rift in the church involves the Protestant Reformation, a revolutionary splintering of the church off from the mother church of Rome. The action that triggered it came in 1517, when the Romish priest famously nailed 95 thesis to the door of the local church in Wittenberg, Saxony-Anhalt, Germany. It has now, nearly 500 years later, been formally undone in a remarkable symbolic gesture made by Martin Luther's namesake organization - only a couple short weeks ago. The following is excerpted from: LWF and the Vatican Announce Common Liturgical Material for 2017. Alongside Junge on the panel were, the president of the Pontifical Council for Promoting Christian Unity (PCPCU) Kurt Cardinal Koch, the Catholica representative of the United Evangelical Lutheran Church of Germany Bishop Karl-Hinrich Manzke, and the chairperson of the Ecumenism Commission of the German Episcopal Conference Bishop Gerhard Feige. Junge and Koch took the opportunity to announce plans for a common liturgical guide in connection with the 500th anniversary of the Reformation in 2017, of which publication is scheduled for 2015. Looking towards 2017, the Lutheran - Roman Catholic material is intended to enable churches all over the world to review the 500 years of Reformation. The guide will follow on from the dialogue document From Conflict to Communion published by both partners in 2013, and transpose it into liturgical acts. The material will reflect the structure of this document with its triple form of penitence for the wounds mutually inflicted; joy at the insights and dimensions of the Reformation; and hope for unity. What happened in December was a milestone. Let's give the reformation some thought. The Devil is a counterfeiter, which means that he works through imitation. The sovereign God's plan is outlined in Romans 11. (What Will Their Acceptance be but Life from the Dead?) It's awesome! He divided mankind into two groups for the purpose of gaining all. The Devil's play with the Reformation uses a similar dynamic. The intent is to reform, as in, taking what exists in one form and making it into another form wherein their goal may be accomplished. The church was formed, basically under the Emperor Constantine, and later divided subsequent to the action Luther was party to, with the ultimate goal of reforming - to gain all. It's Roman's 11-ish. The goddess, who sponsors rebellion on one hand, uses that as a means of establishing unity in a far more potent alliance, a re-formation. This is what the goddess serving Jesuits have always done with their subversive activity. This is the action being taken by the first Jesuit Pope. This is what the Reformation plan really is, not to reform Catholicism but to reform or form again the church to establish it most fully for the Antichrist. The sovereign God's plans are working perfectly. He is discovering who really loves him and who is playing lip service with the hypocrites. Have you seen Luther's Rose, I mean really seen it as the Occult“ mark of the beast” sigil of the goddess of magic that it is (and of sodomite illumination initiation ritual), which is accepted by those who know symbols as establishing the throne of Isis? Consider the related sigil for the LWF, who were in no small way responsible for the “epoch-making turning-point” of December 18. When Martin Luther nailed the 95 thesis to the door of the church, it was on October 31. Reflect on that for a moment. High Ritual. Halloween - Samhain - It's the highest holy day for witches, a day devoted to the worship of the moon goddess and the sun god. These were the same gods being worshiped in the Temple just before Judah was taken into captivity by Babylon, as revealed in Ezekiel. Here's how they are honored today on Samhain by those who wear no such mask as the priests of the Romish worshipers of the goddess. After casting the magic circle, a Blessing Chant invites the blessings of “the Goddess, the Lady of the Moon; and the God, Horned Hunter of the Sun.” The ceremonial rite continues, naming the Sun King and the Gracious Goddess, Eternal Mother, who gives birth to the fallen. “Samhain is the Wiccan New Year. This is the time of year when the veil between the world of the dead and the world of the living is said to be it's thinnest. In the way of the priesthood of the sun, Samhain, long celebrated by the Romish church under a relabeled pretext, would be a most propitious time for such a working as what began on that night in 1517. It bore fruit as the Reformation. Did those apples from the harvest really fall far from the tree? The Goddess work is fulfilling a long play of a “Great Work,” working through agents who are even in, and especially in the church. A vision was given to Ezekiel to show him what was happening in the Temple in Jerusalem. That was a revelation of the idolatry that was in the hearts of the priesthood, and the people. The God of Ezekiel is bearing witness that, as it was in that Temple and with that people, so it is in the Church and with this people today. The men who were prostrating themselves eastward toward the sun and the women who were weeping for Tammuz were following the customs of idol worship. Those acts betrayed the idolatry in their hearts. In the Temple where you worship, and I'm writing these words to you , reading here right now, are those who worship those same idols. Their idolatry is exposed. Perhaps it has already been revealed to you that the Pope worships the same sun god and goddess that was worshiped in Ezekiel's day. Perhaps it has also been revealed how that most of the rest of Christianity follows their customs, with relatively little difference between them. What I'm putting on exhibit involves institutions of the holy temple you may still see as innocent of that same idolatry. Let it speak to you about the idolatry in the hearts of the leaders and the people, and if there is, in this revelation, a personal conviction, take an unblinking look at your own practices that betray idolatry. What lawlessness have you tolerated that you have secretly justified? The work of this hour must pierce deeply, because judgment has come.